Dwelling on his past glory as a prize-winning author, Ryota (Hiroshi Abe) wastes any money he makes as a private detective on gambling and can barely make ends meet or pay child support for his son. After the death of his father, his ageing mother Yoshiko (Kirin Kiki) seem to be moving on with her life with hobbies with the local elderly ladies. Ryota makes extra money by offering his own services to the detective agencies clients. He is offered a contract to write for a manga series with an upcoming artist but his personal ambitions get in the way. He finds his sister Chinatsu is visiting their mother frequently and suspects she is trying sponge off her; he believes she makes their mother pay for her daughter's figure skating lesson's from her social pension. His sister in her turn suspects Ryota's visits are for taking advantage of their mother. Ryota is trying to get back with his ex-wife Kyoko (Yoko Maki) and in a stormy summer night sheltered at his mother's home with his family he attempts to take back control of his existence and to find a lasting place in the life of his young son Shingo (Taiyo Yoshizawa). His ex-wife says it is truly over with them and grownups cannot live only with love, planning is required as well and Ryota isn't cut out to be family man. If he were he would have done so earlier. 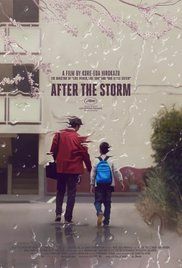 Ryota understands and uses the storm as a chance to bond with his son by repeating a memorable experience he once had with his father sheltering in a local playground as the storm rages. Read more on Wikipedia.